Four days away from my due date and the artwork is hung, the shelves are styled, and the drawers are organized — the nursery is complete, without a moment to spare! This is probably one of my favorite rooms in the house now. My husband painted it (Kentucky Haze by Benjamin Moore), installed floating shelves and hung up all of the artwork, and I stood in the corner and directed (A little to the left! You missed a spot!) — team effort! After all of that hard work it’s one of the rooms in our home that has a sense of completeness — and will feel even more complete when our little tenant arrives soon. I am so excited to share a few more details below! Before it was a nursery we were using the space as a guest room, with two twin beds taking up most of the space. Moving those out made the room feel huge, and we played around with the layout landing on a few ‘nooks’ to make the space functional and flexible. One of my favorite spots is the sitting area, complete with a nursery glider! My friends at Raymour and Flanigan gifted us a chambray colored glider that is so cozy and cute — I’m in love with the upholstery color! 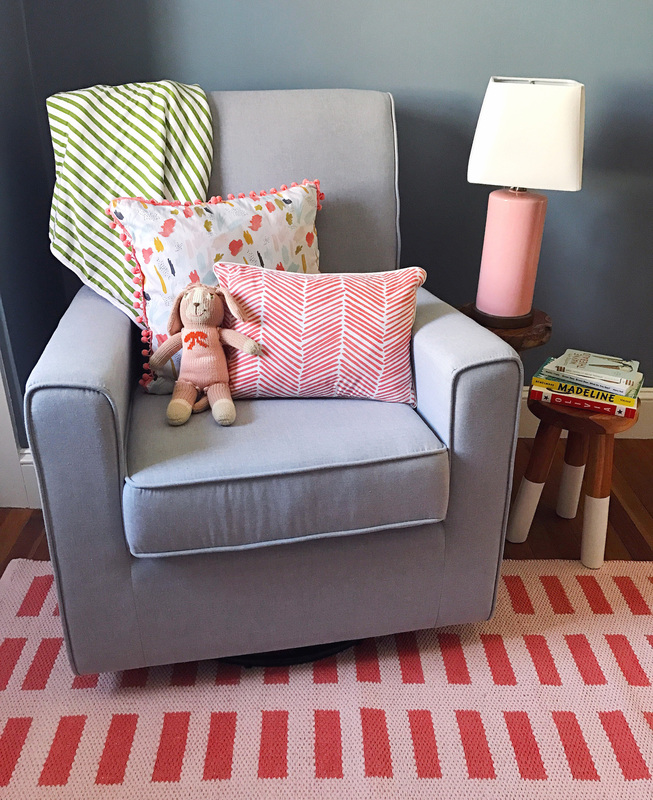 We added some throw pillows made by my mom from colorful fabrics, and added a few paint dipped stools and darling pink lamps from Target’s Pillowfort collection. Right now the stools will be great for resting my phone and a baby bottle, and then can be repurposed when Baby B gets older as play furniture. The next area of the room has the crib and some new floating shelves that my husband installed for us. We were lucky to find shelves that fit the exact length of a slightly recessed wall, so it almost looks like they’re built into the space. I used the shelves to style the extensive book collection we received from friends and family at our baby shower (note to future mom’s-to-be: register for books, it’s such a great gift to give and receive!). 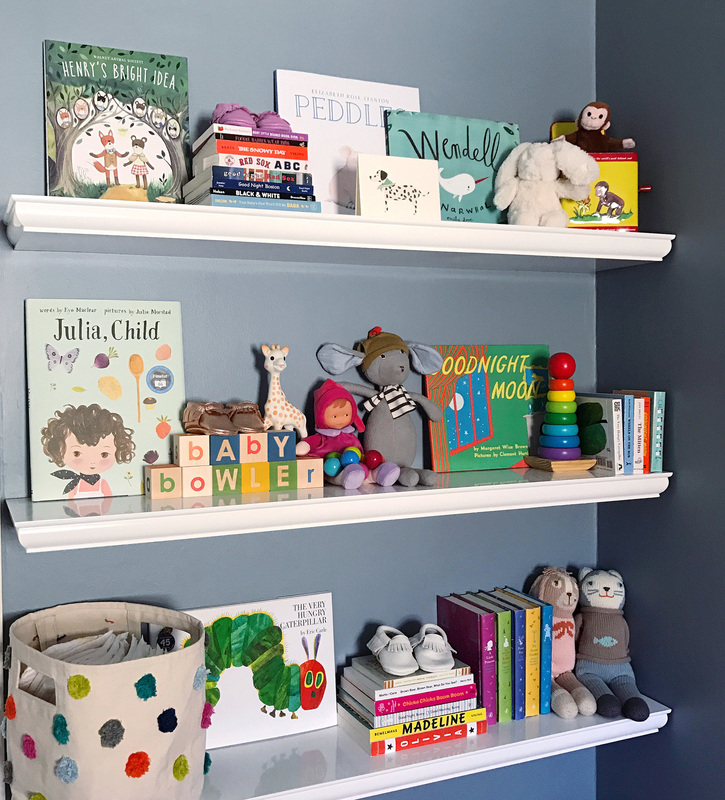 The shelves were also a great place to style and store a few other fun gifts we received, like an impressive collection of baby shoes, alphabet blocks and darling stuffed toys. Below the shelves I tucked some baskets for more storage and plan to use one of the larger baskets as a hamper. 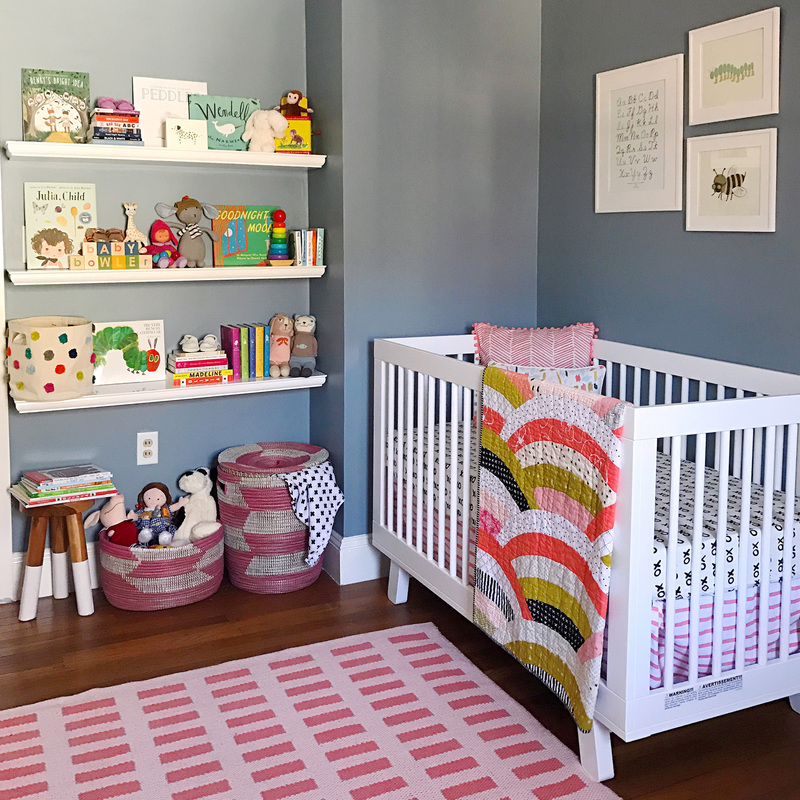 Right after I got pregnant I started a hunt for the perfect crib, and knew almost immediately I wanted the Hudson Crib (c/o Wayfair). It’s got clean modern lines and was neutral enough that I hope if we ever get around to baby #2, it’ll still be in-style and complement any future rooms it may be used in. 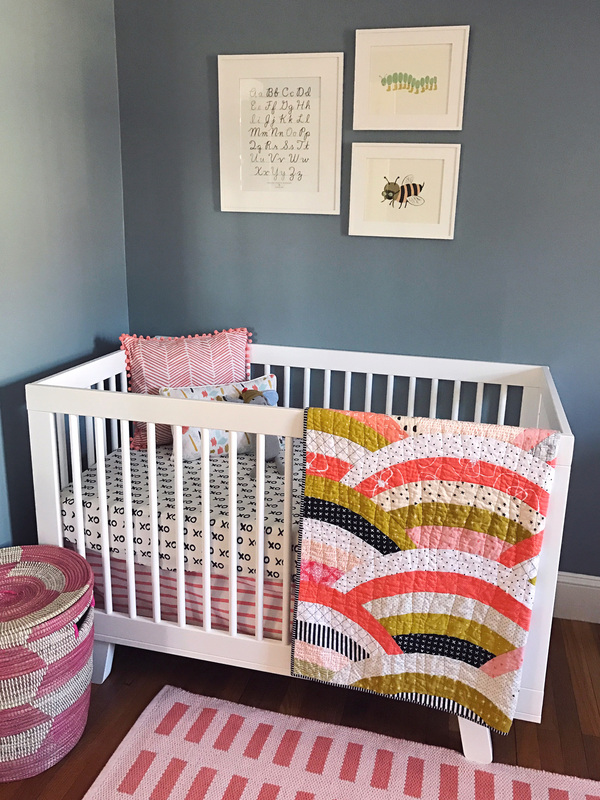 The bedding was a gift from my family and I’m so happy how the mix and match styles of the sheets and crib skirt worked well together (and how about that impressive baby quilt made by my BFF?!). A few simple pieces of artwork are hanging above the crib, featuring some kitschy bug characters and an ABC handwriting print. 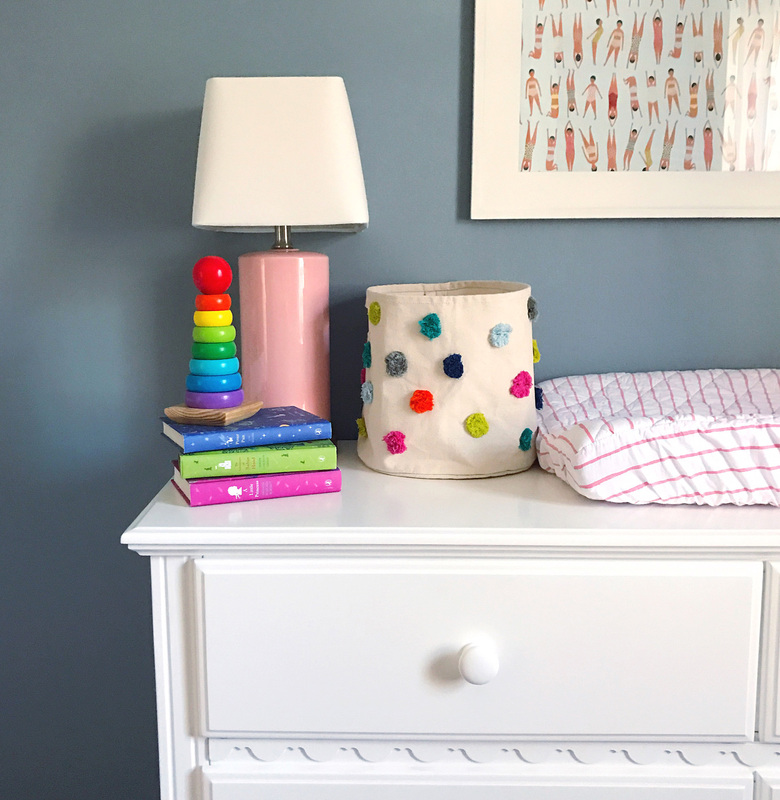 The last corner of the nursery is our dresser doing double duty as a changing station. Instead of a traditional changing table, we added our changing pad on top of a new dresser (c/o Raymour and Flanigan) and are using some of the drawers for clothes, others for diapers and supplies. I loved the little scalloped detail on this dresser when we saw it in the store, and know it’s a piece that should work with the room as the baby gets older. I filled this area out with some functional storage — I adore these Pehr Designs pom-pom baskets — and more pink lamps! I needed a big piece of artwork to hang over the dresser and found a piece of wrapping paper by Red Cap Cards with all sorts of little swimmers and beach bathers in the perfect colors to match the room. It was so inexpensive and had a great impact once we got in the frame and up on the wall! Check out all of the resources for the room here, and shop some of my favorite pieces in the gallery below! Please note: I was gifted product by Raymour and Flanigan and Wayfair for this project. All opinions, images, and content are my own. 2017: Year Of The Hustle. A New Resolution Approach. 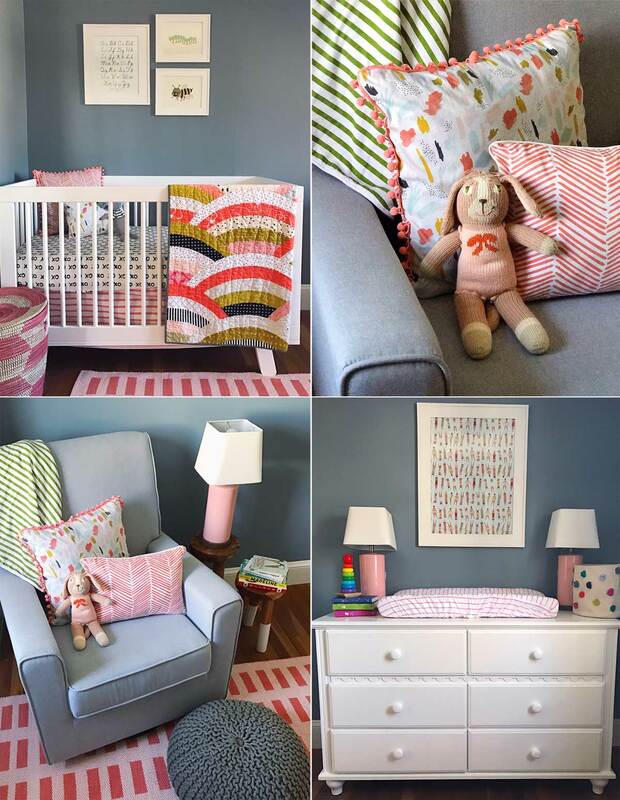 5 Responses to "Nursery Reveal." Looks fabulous! Baby girl’s room is already so stylish! Prettiest little room for baby girl! It all turned out so perfect! It’s gorgeous! I remember looking around the nursery many sleepless and stressful nights and smiling. It helps to create such a happy space. I still think back fondly on the time my husband and I spent creating ours.